Proceedings of the 9th International Conference on Cholesteatoma and Ear Surgery. June 3-7, 2012, Nagasaki, Japan. Publication details: Book. 2013. xii and 496 pages. Publication date: 2013-07-12. Proceedings of the 9th International Conference on Cholesteatoma and Ear Surgery. June 3-7, 2012, Nagasaki, Japan. Many color illustrations and tables. A4 (8.3x11.7 in). It was indeed a great pleasure and honor for me to have hosted the 9th International Conference on Cholesteatoma and Ear Surgery in Nagasaki, Japan. There were 558 participants; four full-day programs provided them with rich scientific programs including six keynote lectures, seven symposia, 26 panel discussions, 12 mini lectures on recent topics, 23 instruction courses, two live cadaver temporal-bone dissections, three sponsored sessions, three other sessions, and three days of temporal-bone dissection courses. I would like to take this opportunity to express my greatest gratitude to all the faculties who contributed enormously to these scientific programs only to facilitate and improve the academic quality of all the participants. We also thank all the staff members who worked relentlessly for several years to help make this Conference a success, and the participants who took part in the Conference. I hope that the Conference was really fruitful to everybody. It has been a tradition to publish paper proceedings after each International Conference on Cholesteatoma and this is the first time the proceedings were published as e-book on the website of the Conference. The advantages of this e-book are that it is of high quality, and any article can be downloaded by participants for free. It will be usable on multiple devices: computer/laptop, tablet PCs (iPad), iPhone, e-readers, etc. It is fully searchable and has easy navigation. If you want a copy (paper book) Kugler Publications can also provide POD (Publishing on Demand) copies for a reasonable price. 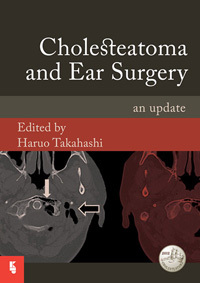 The e-book will be kept open on the web at least until the next Cholesteatoma Conference. I hope that you will enjoy this e-book as much as the traditional paper proceedings, and that it will stimulate scientific and academic accomplishments of all of you. Finally, I am very much looking forward to seeing all of you at the 10th Conference in Edinburgh in 2016! How to deal with cholesteatoma in a developing country. Will the canal-wall-up (CWU) technique provide an opportunity to control the disease? Intra-tympanic dexamethasone injections: Are they effective for long-term control of vertigo? Cholesteatoma in children with cleft palate – does routinary tympanostomy make any difference?